In the unlikely event of an eruption of the Yellowstone Caldera, the largest such explosion in the written history of humanity, would produce ash of such enormous quantities that it would cause massive disruptions on Earth, especially North America. Global climate would be changed and, locally, an eruption of the 1,500 square mile area in what is mostly the northwest corner of Wyoming would likely drop ash from three to five feet on the Billings, Montana area. Los Angeles could see accumulations approaching one and one-quarter inches. The vast area is a supervolcano, which is a volcano capable of emitting more than 240 cubic miles of material, or about 1,000 cubic kilometers. Geologists know such eruptions as “VEI-8” on the Volcanic Explosivity Index. As interesting as the ash-fall projections are, Jacob Lowenstern, the science leader at the Yellowstone Volcano Observatory, said the intent of the study was aviation safety. The well-known eruption of a volcano in Iceland in 2010 stopped air traffic throughout northern Europe for several weeks. Millions of travelers were stranded in what was the largest closure of air traffic since World War II. 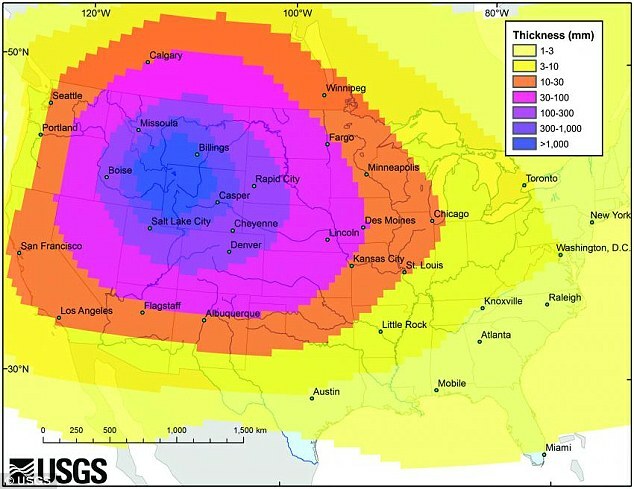 How an eruption of the Yellowstone Caldera supervolcano would distribute ash across the United States. Mastin and another colleague, Alexa Van Eaton, worked to understand how winds could be created from the mass, heat and particles from a big eruption. According to their data, such winds would rise miles above Earth to the edge of the stratosphere and actually negate the prevailing winds of the jet stream, ultimately spreading evenly as an umbrella cloud. On the other hand, ash plumes from smaller eruptions look more like smoke from a smokestack as they they spread downwind from their volcanoes. Initially, when a simulation was run without an umbrella cloud, no deposition of ash was seen on the West Coast of the United States. However, with a likely and active umbrella cloud as part of the projections, ash would fall to Earth in Washington, Oregon and onto the surface of the Pacific Ocean. Ash would also be seen on the East Coast of the United States. Because the ash is pushed up and out near the center of the eruption there actually would be less ash fall there. Mastin changed the dynamics of his model, accounting for different wind flows that are normal during the four seasons of the year, as well as playing with the duration of the eruption. He says that, ultimately, the direction the winds come from does not matter, that the amount and location of ash from a Yellowstone Caldera eruption would be similar, regardless of seasonality. The most recent super volcano eruption was 26,500 years ago on the North Island of New Zealand. 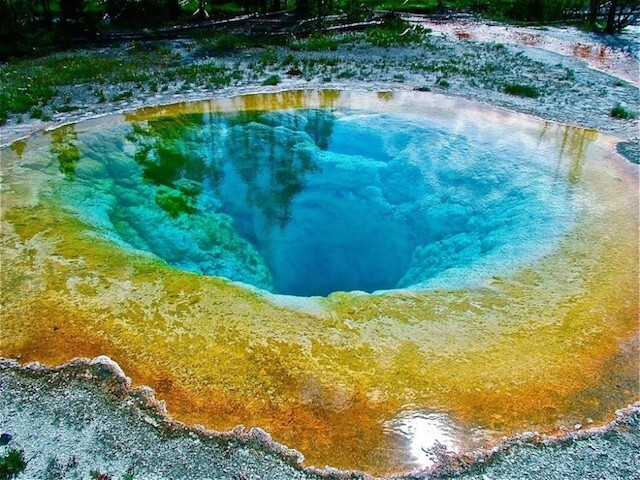 The most recent eruption in Yellowstone – a relatively mild one – was 70,000 years ago. More massive eruptions occurred 640,000, 1.3 million and 2.1 million years ago. Those eruptions were responsible for up to six feet of ash deposits in the Great Plains. Mastin says that the color of such ash was most likely brown and after being blown around by winds, formed into dunes. A recently published study by Mastin and others on a possible Yellowstone Caldera eruption says that North America would likely see a shutdown of electronic communications (as well as air travel) for an undiscussed amount of time. In addition, Earth’s climate would see major changes. However, the Caldera continues to behave as it has over the past 140 years, indicating that, although surely disastrous, an actual eruption is unlikely in the foreseeable future. 2 Responses to "Yellowstone Caldera Eruption Unlikely but Would Be a Massive Disaster"
Greetings! I’ve been following your web site for some time now and finally got the courage to go ahead and give you a shout out from Lubbock Tx! Just wanted to tell you keep up the excellent work!